February 1, 2015 ~ Craig M.
Glenn, Frith, and Hoopes. Source: jasonhoopes.com. 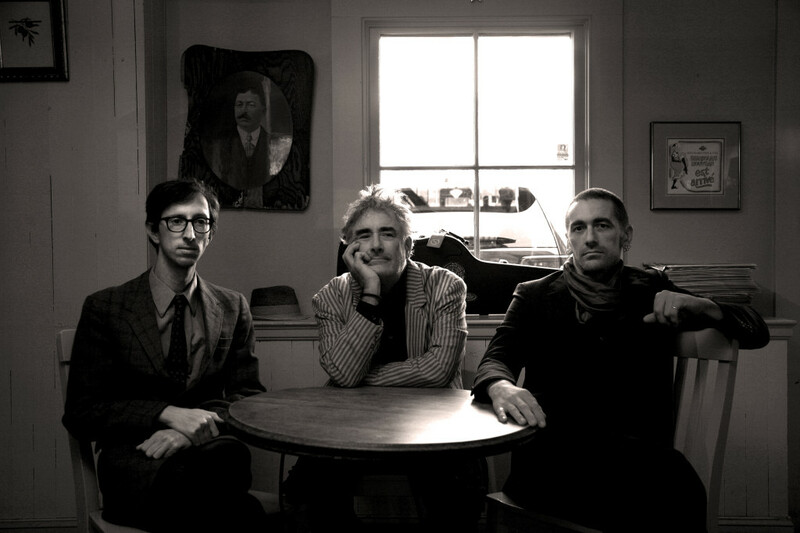 Fred Frith‘s new trio will be touring around Europe late in February. As a prelude, they’ve played a couple of shows here in the Bay Area, including one at Slim’s that I got to see recently. It’s a long-form improvising trio — you could certainly call it a power trio — with Jason Hoopes on bass and Jordan Glenn on drums. Electronics and loops help the bass and guitar build a screen of lingering sound, often dark and heavy. Listening to Hoopes in the band Eat the Sun was good preparation, actually. In front of that curtain of sound, each player adds virtuosity to color the piece. 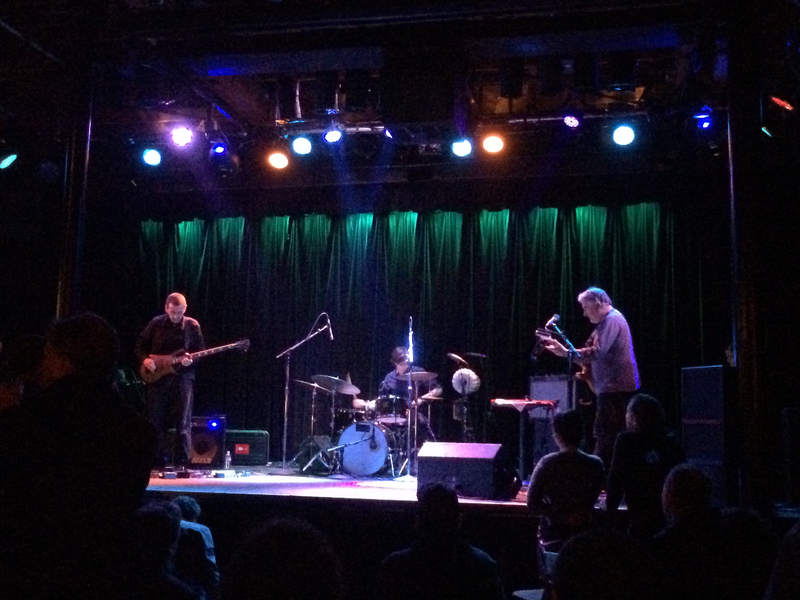 The first of three long pieces they played started with a blast zone created by Frith and especially Hoopes, who was sawing away at one high note on the bass. That put Glenn in the spotlight quickly, with fluid drum rolls and high-precision hammering. Hoopes stayed in a supporting role for a long while before finally taking a lead voice with a thick, bubbling stew of bass soloing. Hoopes is terrific on electric bass, and it’s always a treat to hear him really cut loose. This trio offers him a lot of space to do that, although you get the sense that he directs more energy toward shaping the overall sound. Of course, Frith contributed too, with many of his usual tools, such as bows and other implements against the guitar strings. Recently, I was reading a critic raving about Frith’s detuning of the guitar during solos — about how he was able to make that “wrong” sound fit just right. I hadn’t thought about that too much, but as Frith untuned his low E string during one span, it struck me that it really was just right and in “tune” with the logic of what he was doing. Frith added a lot of conventional playing as well — crisp and chirpy sounds harkening back to his prog days. It was a terrific set, although I have to admit I lost the thread at times. The drone or roar of the guitar and bass sometimes overwhelmed the sound for me; there was always something going on underneath it, but sometimes my mind had trouble penetrating that roar. That’s not always a bad thing (“drone” is a legitimate musical form, and this was certainly not a sleepy drone) but I could have used some more dividers in the music. It’s possible I was just too worn out on a Thursday night.